During my recent trip back to Malaysia and reunion with my immediate family to celebrate my parents’ Golden Anniversary, we took this opportunity to catch up on foods that we cherished as we were growing up in that part of Southeast Asia. I recently blogged about the wonderful dinners and banquets, whether Chinese or Peranakan/Nyonya, that we relished in while back there. 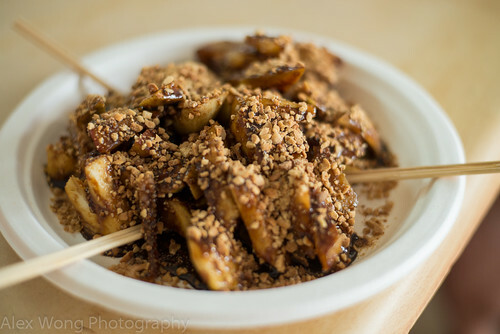 Equally delectable are the hawker or street foods that one finds on the streets or the informal coffee-shops that most locals patronize for their daily meals. 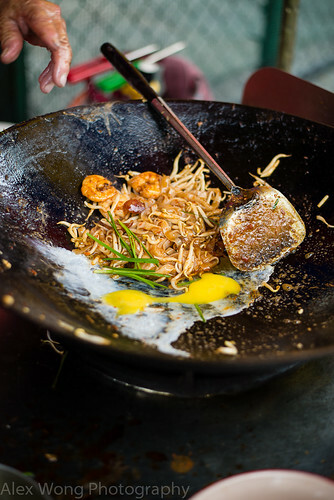 Hawker or Street food from this part of the world is renown and well-written about by gourmands and food writers. Here is the run down of some of the dishes available. 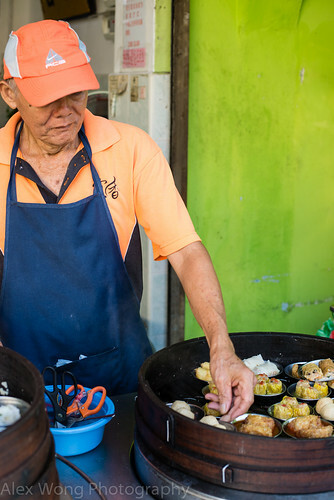 1) Dim Sum: It was a change to see these Cantonese small bites being cooked and served roadside, and not in the restaurants, as it is served in the city. 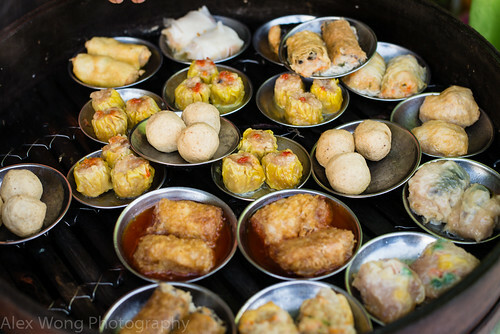 These small dishes were equally tasty and full of variety, and the way Malaysians enjoy these bites is with some sweet Hoisin sauce and vinagery chili paste, very Southeast Asian. 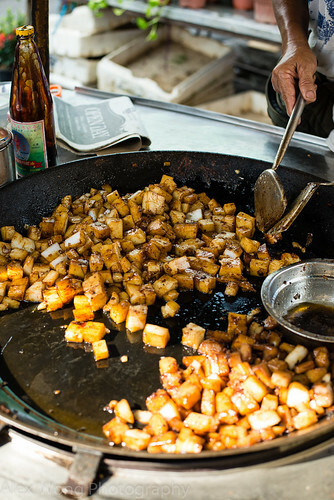 It is a pity that such street-food tradition is quickly dying out in these fast times. 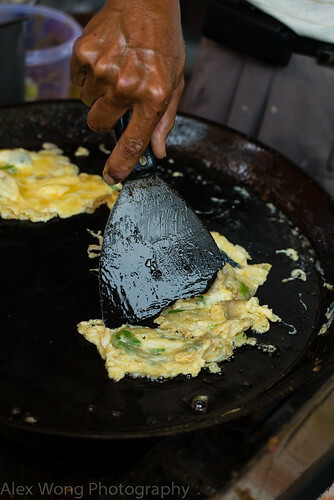 2) Char Tau Kueh: This is another common breakfast item usually found in markets during the morning time. 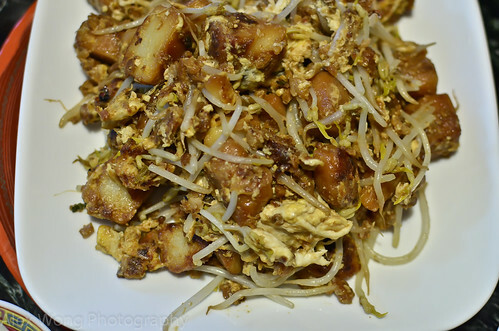 Rice cake squares are fried with some garlic, salt pickled vegetables, bean sprouts and eggs, seasoned with some light and dark soy. 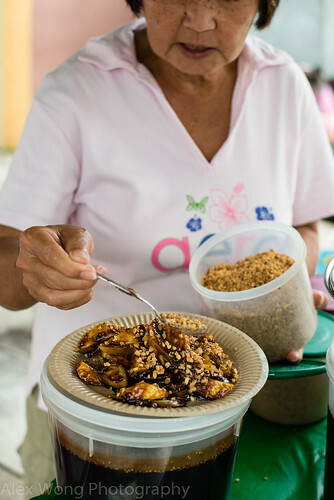 My mother would frequently bring this back from the morning market, and we always enjoyed it with some sour chili sauce. 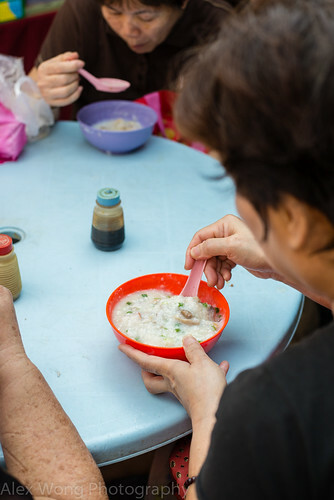 3) Rice Porridge/Congee: This common Chinese breakfast staple is basically a rice gruel made with cuts of meat or seafood. This reminds me of my maternal grandmother who would take me early in the morning to an alley in town to savor a version made with slivers of fresh fish and ginger. Such a simple meal only needs a touch of soy sauce and some white pepper – nothing else. 4) Fish Ball Noodle: Another mild tasting, but not short in flavor, breakfast item is this bowl of noodle soup. 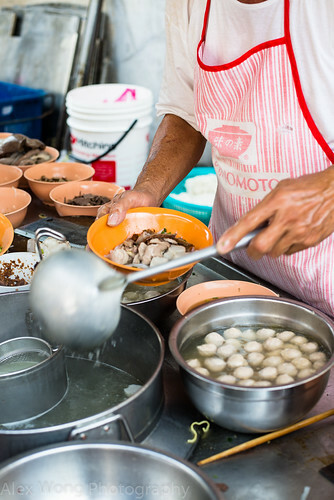 Fine strands of rice noodles are paired with some minced fish meat balls, and moistened with a rich but clear fish stock. A few salted vegetable pickles are usually added for some flavor. A mild but satisfying start for the day. 5) Roti Chanai/Murtabak: Most Malaysians do not live on mild dishes alone living in this part of the world infused with different culinary traditions. 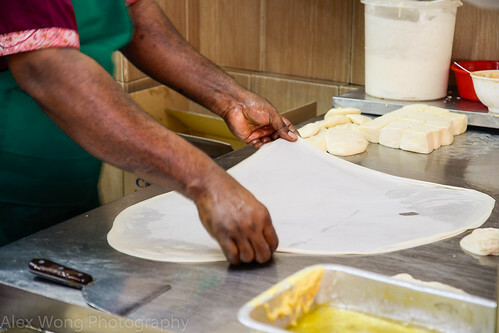 Here we have a South Indian breakfast item of wheat flour dough stretched and layered with drops of ghee (clarified butter), much like puff pastry, before being cooked on the griddle. 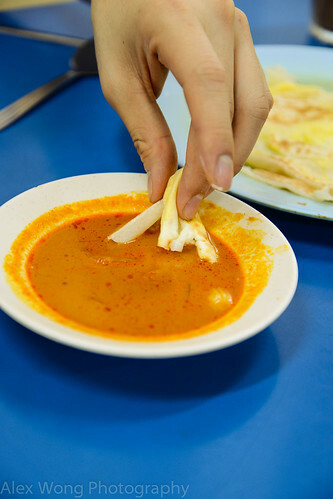 The accompanying sauce is a fragrant and spicy sour curry (usually made with fish head) that adds all its flavors to the mild bread. 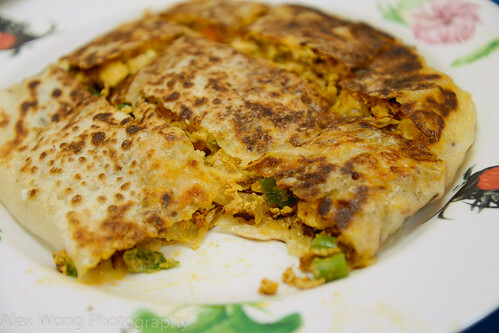 Another type is the stuffed version, Murtabak, as in this case made with minced meat, onions, and green beans. An exciting and tasty start to the morning indeed. 6) Bah Kut Teh: A Malaysian favorite is a pork stew consisting of ribs or pig feet cooked in a heady soup made with garlic, cinnamon, star-anise, licorice and lots of Chinese dried herbs. This fragrant mixture is usually served with rice, but on this occasion, the meal came with some parboiled egg-noodles, adding a wonderful twist to this common staple usually served for breakfast or after a late-night out. 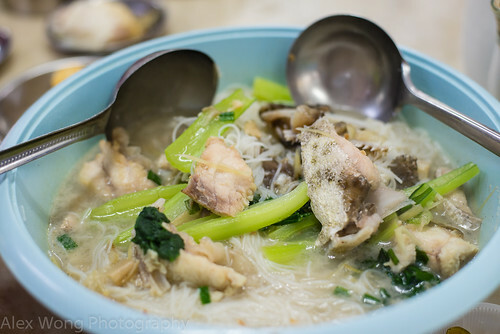 7) Fish Head Noodles: This noodle soup dish is similar to the fishball noodle soup, but in this case, pieces of fish head are served instead. 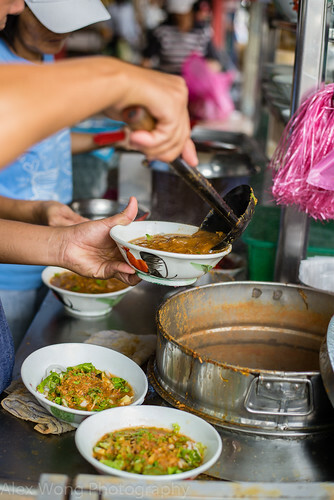 The bony bits add a stronger fish flavor to the broth, and Malaysians are very adapt in finding the flesh in between the bones and cartilage. I must say that I quite enjoyed this dish despite not having eaten it much in the past – definitely not for the mild and meek breakfast taker. 1) Rojak: This is a refreshing start for lunch, a salad consisting of fresh Jicama/Bangkuang, bits of mango and cucumber, and some parboiled vegetables. 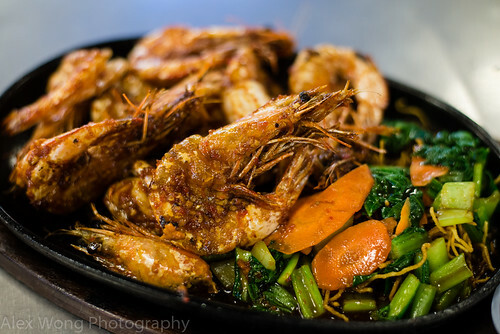 But what ties the ingredients together is a thick sweet and salty sauce made with dark soy and savory shrimp paste. A topping of nutty crushed peanuts seals the deal here – completely irresistible. 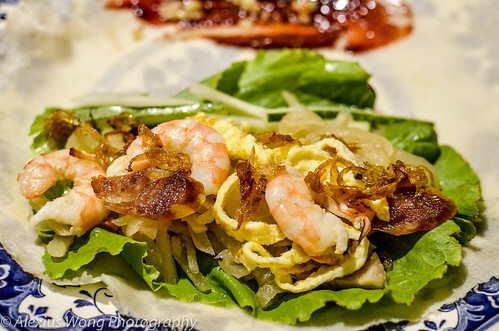 2) Poh Piah: This Peranakan/Nyonya standard fare consists of thin rice crepes stuffed with cooked Jicama/Bangkuang, Chinese sausage, egg strips, crab meat, and some shrimp, seasoned with fried shallots, crispy pork lard, raw garlic, and some Hoisin and chili sauces. This time-consuming dish is especially beloved by my family members since it was prepared by my grandmother often. My auntie is always kind enough to invite us over for this meal every time we are back visiting, and we feel obliged to stuff ourselves silly with it. This dish is to this day served and eaten in the port of Xiamen, Fujian, China, from which many Peranakan ancestors come from. 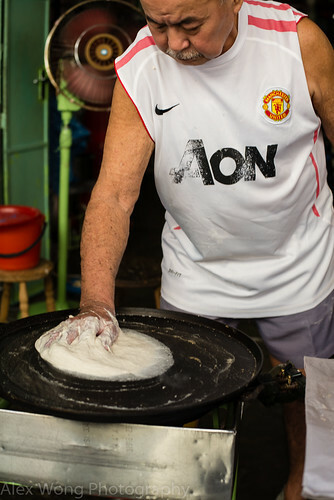 It was truly a rare sight to come across this Poh Piah crepe maker in public when walking around in Penang. 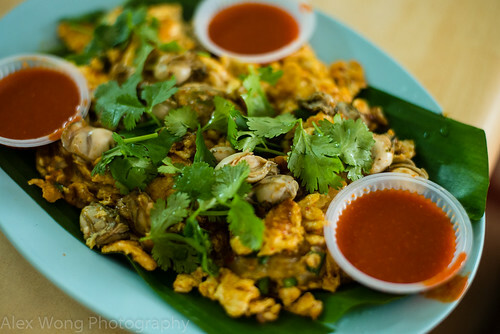 3) Ho Chien: This small bite consists of tiny oysters cooked with a rice flour and egg mixture, much like an omelet, and served with a vinegary chili sauce. Eating this dish always brings back memories of visiting my father’s hometown of Malacca, and relishing this dish by the seaside. 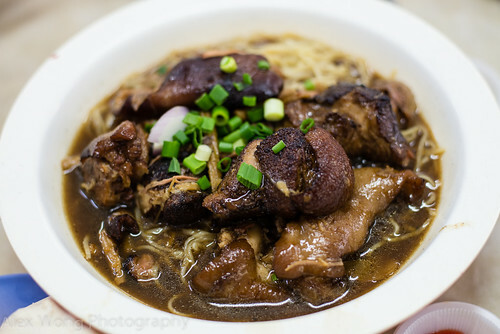 Just like the above dish, this dish is also commonplace in Hokkien communities in Thailand, Fujian and Taiwan. 4) Char Kueh Tio: This Malaysian favorite can be found in nearly all coffee-shops or food courts in this part of the world. 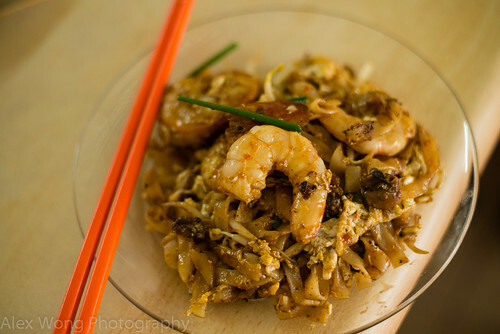 Wide rice noodles are stir-fried with some shrimp, Chinese sausage, cockles, eggs, Chinese chives, and bean sprouts to produce a heavenly result that the Malaysians always seem to be on the hunt for the best version. The traditional use of lard and crispy pork fat takes this dish to gastronomic heights. Yumm! 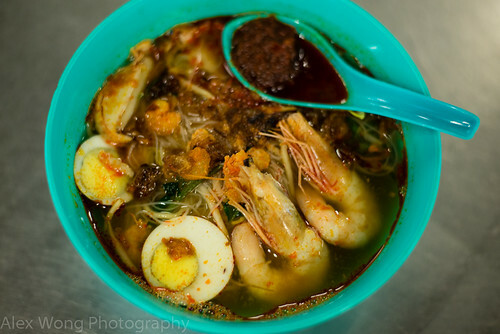 5) Asam Laksa: This noodle dish hails from the Penang Peranakan culture. Round rice noodles are bathed in a sweet and sour broth made fragrant from lemongrass, galangal, and turmeric, meaty with shredded mackerel, and sour from the use of tamarind. 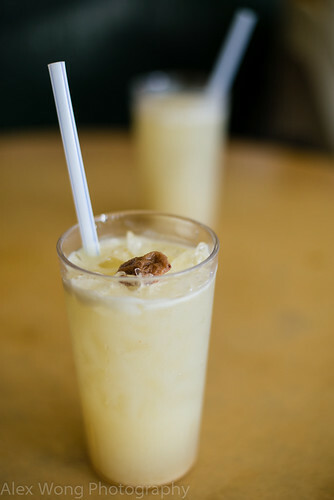 The sprinkling of fresh pineapple, fresh cucumber, and fresh mint add the necessary refreshing elements to each slurp. The spoonful of dark shrimp paste sauce is de rigueur as it adds another level of savoriness to the already superb broth. 6) Hainanese Chicken Rice: This chicken dish hails from the Hainan culture which is renowned for their superb cooks. 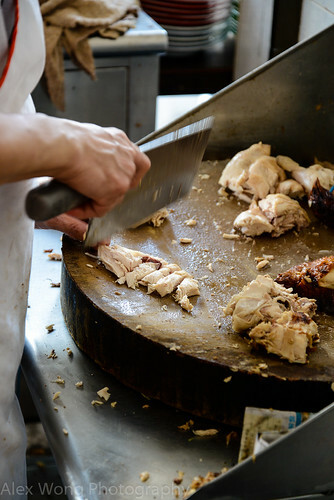 It is a simple dish but difficult to master as the cooked chicken still retains its collagen after a complex boiling process, producing a moist and silky-smooth meat. The rice is cooked with the chicken fat and broth to give the simple grain lots of flavor. 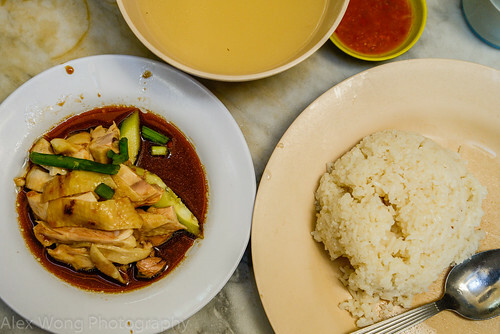 A side of chicken broth is usually served along with some chili sauce for the plain chicken pieces – a favorite of many Malaysians which we savored a number of times on this trip. 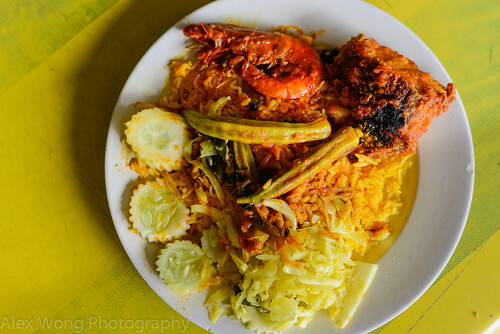 7) Nasi Kandar: This rice dish is served by the Mamak community, Indian Muslims. Here we have rice made yellow and fragrant from lots of heady spices, served with any sides to the diner’s desire. On my plate I chose some chili shrimp, fried fish, along with some okra, cabbage, and cucumber slices. The variety of toppings to choose from can be mind-boggling, but the result is a tasty and satisfying rice dish. 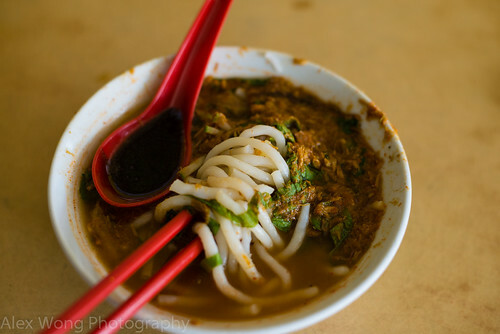 8) Har Meen: Penang is famous for this noodle soup dish, which was where I had this bowl. Noodles are paired with a spicy and fragrant shrimp stock along with cooked shrimp, chicken, boiled eggs, and bits of vegetable. What makes the dish sing is the quality of the stock made from shrimp shells, and this version was one of the best I have ever tasted, while sitting next to the beach for dinner – not a single drop of that tantalizing broth remained at the end. The side of cooked chili paste adds some depth along with some more spice heat to the dish. 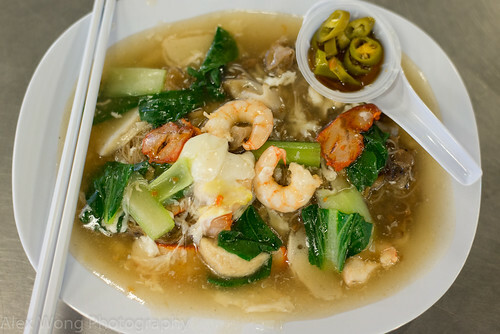 9) Wat Tan Hor Fun: This noodle dish is a Malaysian Cantonese staple. Wide rice noodles are covered with a thick egg white sauce filled with bits of seafood and meat. The slippery consistency of the dish is a texture that most in this part of the world enjoy with their noodles. The side of pickled green chilies is typically served since Southeast Asian sensibilities search for spicy and sour elements to act as a foil to rich flavors, as is in the case with this dish. 10) Saté. 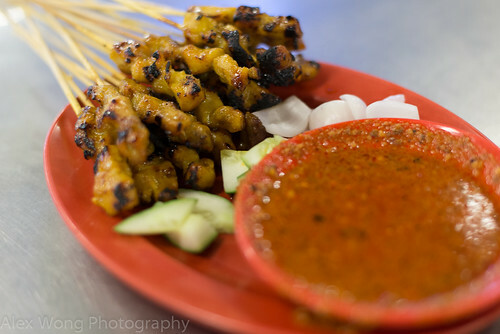 Most Westerners have probably tasted this Malay dish but not in its original version. Here we have short skewers with small pieces of well-marinated meat on them, and charred on top of burning charcoal. To keep them moist, they are occasionally doused with a mixture of coconut milk and oil with a crushed lemongrass as the basting brush. The side peanut sauce is another element that can make the dish a hit. The pieces of cut white onion and cucumber provide the refreshing relief to the rich flavors. 11) Sweet and Spicy Shrimp: Pieces of large unshelled shrimp are coated with thick sweet and spicy sauce before grilled until the shells are crispy and completely edible. The side of crispy noodle with a bare sauce accentuates the crispy nature of the dish and making this seafood dish complete. 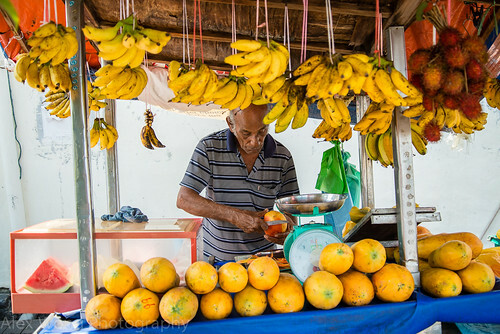 1) Seasonal Fruits: Without fail, you will come across a vendor selling fresh-cut seasonal fruits, as in this case, watermelon, papayas, bananas, and rambutans. 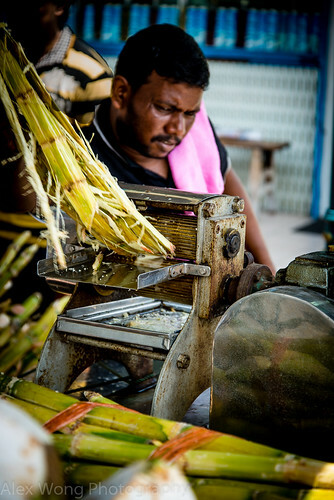 2) Sugarcane Juice: The sight of the sugarcane press is not evident in the city much these days but I was glad to come across this stall in Little India, Penang, and I could not resist getting a glass full of this sweet juice to cool down from the sweltering sun. 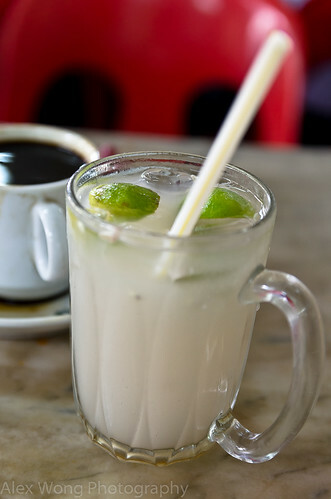 3) Malaysian Coffee/Lime Barley Drink: Malaysian are fond of their coffee, a unique roast of coffee beans with chicory in margarine to produce a rich but bitterless brew. For something cooler, I usually order the chilled sweet barley drink with a few squeezes of lime. 4) Calamansi Lime Drink: Here we have a drink made from squeezing of the local Calamansi, a very tart citrus, much like Key Lime. The addition of a salted plum adds more tartness to this refreshing concoction, as if it were not sour enough. 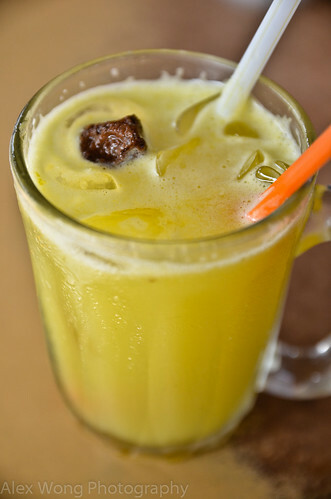 5) Nutmeg Juice: I had this drink in Penang which is known for its nutmeg plantations. It is quite sweet with a tartness from the nutmeg oil found in the flesh. It maybe too strong for some but I quite enjoyed it despite its astringent nature. Whew. Did we eat and drink all of these? Yes, indeed, and we still couldn’t get enough of the dishes. 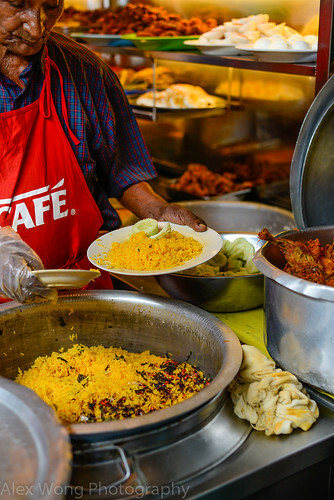 Such tempting and delectable wide-variety of offerings has only one single effect on the receiving end – a food-obsessed gastronome, which most Malaysians are. We talk and think about food all the time, when and what is the next meal, and where to find the best rendition of these dishes, even when we are out of Southeast Asia. Most of my non-Asian friends are perplexed by such obsession but once they have visited this part of the world, they start to get a slight inkling of said nature. With the first dish, resistance becomes futile for the diner, and welcome to the club!